Blue Spirit Maldives liveaboard - Book now ! Blue Spirit is the embodiment of a comfortable and traditional Maldivian diving liveaboard and able to provide a more exclusive diving experience than most other vessels can offer due to it’s smaller size. Blue Spirit measures 26m in length with a beam of 7m. Her shallow draft means she can moor in smaller and quieter lagoons which are inaccessible to larger vessels. 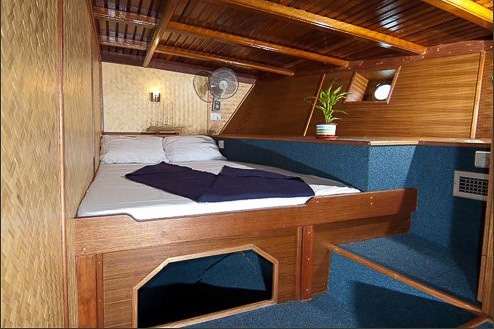 She caters to just 12 divers and offers six en suite and fully air-conditioned cabins. 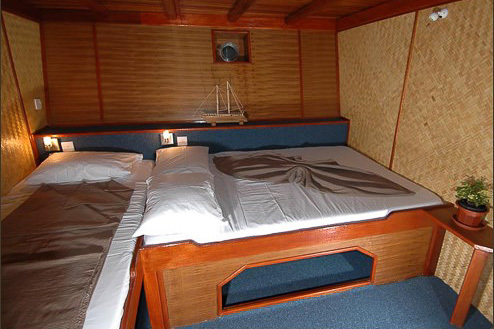 Cabins include two double berth and four double/twin berth with lavishly fitted interiors. Located on the main deck is the saloon with separate dining and relaxation areas. Photographers will delight in the facilities on board with ample storage and recharging points found in the saloon. Guests looking to unwind can do so in the saloon where you can kick back and watch a DVD from the on-board library which also includes marine identification books and other literary pieces. Blue Spirit includes a sun deck with superb views of the Indian Ocean, as well as a shaded area. Meals are served at a table to the front of the boat providing a wonderful alfresco dining experience. Guests will enjoy the culinary delights of a fantastic Sri Lankan chef who has been with Blue Spirit for over 15 years and serves a mouth-watering mixture of local and Western cuisines while soaking up the panoramic views of the Maldives. 50% is due to 90 days prior to departure - non refundable. Rental equipment is based on availability. To assure availability of equipment please reserve in advance. All dive and photo equipment rentals are paid onboard the yachts. Blue Spirit caters to just 12 divers and offers six en-suite and fully air-conditioned cabins. Cabins include two double berth and four double/twin berth with lavishly fitted interiors. She is a traditional boat with beautifully crafted features. Bed sheets and bath towels are provided and changed regularly. However, guests should bring their own beach towels. Requirements: Certified to dive to 30 metres, experienced and comfortable with medium to strong currents. Escape the cold and the festive madness for a tropical Christmas with blue o two in the Maldives. Explore the central atolls on this exciting 7 night itinerary. Explore the southern atolls of the stunning Maldives with blue o two and experience some of the best diving the Maldives has to offer. Our classic 7 day adventures offer some of the most exciting diving in the Maldives including manta points, the chance to see hammerheads, experience exhilarating channel diving and see some amazing critters. We even have night diving with sharks and mantas! With our years of diving experience, our trips will take you to the best dive sites reflecting the seasons and conditions. Escape the cold and the festive madness for a tropical Christmas. Top dive sites: Orimas Thila – North Ari, Rasdhoo Madivaru, Guraidhoo Kandu – South Male Atoll, Fish Head – North Ari and Kandooma Thila – South Male Atoll. Requirements: Certified to dive to 30 metres, experienced and comfortable with currents, recommendation of completing PADI Advanced Open Water or Deep Diver Adventure Dive either before or during trip. This 7 day Maldives dive safari takes you to some of the highlights of the Central Atolls, including the North and South Male Atolls, Rasdhoo Atoll and more. A chance to discover some of the Maldives most famous dive sites, renoened for sightings of sharks, eagle rays, turtles and diverse fish. Explore the southern atolls of the stunning Maldives with blue o two and experience some of the best diving the Maldives has to offer. Enter a wonderful world of beautiful coral formations, channel dives and submerged pinnacles. There really is so much to explore in this 9-night diving adventure with the possibility of shark, eagle ray, tuna, manta ray and whale shark sightings. Top dive sites: Mulaku Kandu – Meemu Atoll, Guraidhoo Kandu – South Male Atoll, Fushi Kandu – Laamu Atoll, Olhugiri Kandu – Thaa Atoll and Kandooma Thila – South Male Atoll. The name of this fantastic itinerary says it all! The ‘Best of the Maldives’ itinerary takes you to a selection the most fantastic dive sites in the area to show you the best of the Maldives in 10 nights. Dive pristine reefs, explore beautiful caves and overhangs, and experience thrilling shark dives in some of the best areas to see hammerheads and grey reef sharks. Top dive sites: Rasdhoo Madivaru, Fotteyo Kandul – Vaavu Atoll, Mulaku Kandu – Meemu Atoll, Guraidhoo Kandu – South Male and Fish Head – North Ari. Explore the southern atolls of the stunning Maldives with blue o two and experience some of the best diving the Maldives has to offer. Enter a wonderful world of beautiful coral formations, channel dives and submerged pinnacles. There really is so much to explore in this 10-night diving adventure with the possibility of shark, eagle ray, tuna, manta ray and whale shark sightings. This itinerary gives you 10 days on board. You will adventure from Huvadhoo Atoll, across the Equator to the isolated atoll of Foammulah and to the southern-most atoll of Gan Addu. A domestic flight will take you to the very far south of the Maldives - an area described as “the new Maldives”. The diving is without doubt incredible and offers the opportunity to dive with schooling sharks, vast schools of fish and squadrons of eagle rays - on top of this, the incredible hard coral reefs are packed with colour and critters. And don’t worry - we’ve found manta points too! These trips offer exciting diving for experienced divers with adventure in mind. Top dive sites: Huvadhoo, Fuvahmulah Atoll and Gan Addu Atoll. This exciting trip cruises all the way from the very far south of the Maldives back to Malé - taking in the finest dive areas along the way. The far south offers the opportunity to swim with hundreds of schooling sharks, vast schools of fish and squadrons of eagle rays - on top of this, the incredible hard coral reefs packed with colour and critters. And don’t worry - we’ve found manta and whaleshark points! The far south offers exciting diving for experienced divers with adventure in mind. This is a stunning trip so expect some amazing scenery and varied diving. This itinerary gives you 12 days on board and will cruise from the southern-most Atolls of Huvadhoo and Addu via Laamu, Thaa, Meemu and Felidhoo Atolls all the way back to South Malé Atoll. Top dive sites: Huvadhoo, Thaa Atoll, Addu Atoll and Laamu. This itinerary gives you 12 days on board and will take in some of the finest dive areas in the Remote Far North. We plan to cruise and dive through the atolls of Raa, Baa, Lhaviyani, Noonu, Shaviyani, Haa Dhaalu and Haa Alifu. Top dive sites: Lhaviyani, Raa and Noonu Atolls and Haa Alifu, Haa Daalhu and Shaviyani. The Maldives offer the best that diving and snorkelling has to offer, Manta rays are guaranteed on pretty much every trip and there are a myriad of sites where you can see these beautiful creatures of the sea. All of our liveaboards will do the best to give you the best experience possible dependant on the current conditions on the date of your trip and our boats are liveaboards for people enthusiastic or serious about their diving but also welcome snorkellers and non-divers who will have their own separate itinerary. One of the highlights of any Maldives safari is the possibility to see one of the gentle giants of the ocean. Whale sharks are unusually common in the Maldives and are seen nearly year round in some areas and all our liveaboards will do their utmost to give you this chance encounter of a lifetime. Diving from a liveaboard in the Maldives is without doubt one of the cheapest and easier ways to experience the best that the Maldives has to offer and these are, in our opinion, the best liveaboards in the area in terms of value for money, comfort and quality of service. Description: One of the best dive sites for soft coral and fish life. The marine life here is so abundant, that the divers have named it ‘fish soup’. The thila is in a circular shape and can be covered in a single dive at different depths, if the current is not very strong. Description: The thila is about 80mters in diameter. The whole thila can be done at different depths in a single dive. There are manycaves and overhangs around the thila. The large rocks on the north eastern side have large black coral trees growing on them. The site is famous for the sharks and a great barracuda which reside here. The site can be dived at any time of the day, each with different activity going on the reef. The best chance to get close to these creatures is at night time, when they are hunting. You will see sharks, barracudas, rays and eels trying to grab a morsel. Description: The northern tip of Magaa reef extends into Bathalaa Kandu and is home to a number of grey reef sharks and white-tip reef sharks. They can be seen patrolling along the reef looking for food. Description: The thila is known for the abundance of soft coral growth on the thila, particularly the blue/violet colored variety that grows on the ceiling of the caves and overhangs, thus the name ‘blue caves’. In addition a large variety of fish life can be observed here. Description: The reef on the southern side of Rasdhoo drops vertically to the ocean depths. The site is home to a school of Scalloped Hammerhead sharks (sphyrna lewini). In the early hours of the morning they rise from the deep waters off the atoll into the shallower depths, accessible to divers. Description: Since the eastern side of the channel is Open Ocean, large predatory fish can regularly be spotted here. This site is famous for sightings of sharks, schools of eagle rays and the occasional Sail fish and Hammerheads. The best condition to do the dive is when the current is flowing into the Atoll. The dive begins on the outer reef following the current into the atoll. Most of the pelagic species can be observed on the eastern side, where the reef drops off into the deep ocean. At the end of the dive in the channel, along the reef you can find overhangs with plenty of soft coral growth and small fish. Description: Located in a channel, the reef is subject to strong currents at times. The ocean currents carry lot of nutrients to the reef, supporting an abundance of sea life. The site is well renowned for the soft coral growth, turtles, diverse fish life and invertebrates found on the reef. At the reef slope you may find sharks and eagle rays. Type of dive: Drift dive / channel dive. Description: Similar to Guraidhoo Kandu, but more sharks are likely to be spotted here. The currents can be very strong at times. The stronger the current however the better chance of seeing sharks. Under the guidance of an experienced dive guide, the dive can be managed done easily. What are the arrival procedures on this trip? The embarkation time for the vessel will be dependant on the itinerary of the trip. Please contact us before booking your international flights. Check out on the last day will take place after breakfast, where you will be transferred back to Male airport for your flight home. If you have a late afternoon/evening flight, please contact the staff on board to discuss options for day use facilities at a local hotel. Other option is once you have disembarked the liveaboard vessel, you may have some time before your flight home in which you may want to explore the local area. There is the option to store your luggage at Male Airport in a luggage room at the cost of $5 per item or $10 per oversized/heavy item. This can be found by visiting the main information desk in the airport. What is the children policy? Children under 18 years of age must not be left unsupervised on-board or in the water. Parents and Guardians are responsible for the supervision of children under 18 years of age. One parent/guardian must supervise children during dives. This may mean that parents are not able to dive together. Guests are not advised to bring children under the age of 12 on a liveaboard safari due to the environment and the nature of the holiday.